The wife and I braved the afternoon drizzle yesterday to visit the sales gallery of THE INTERLACE, located at the former Gillman Heights site. 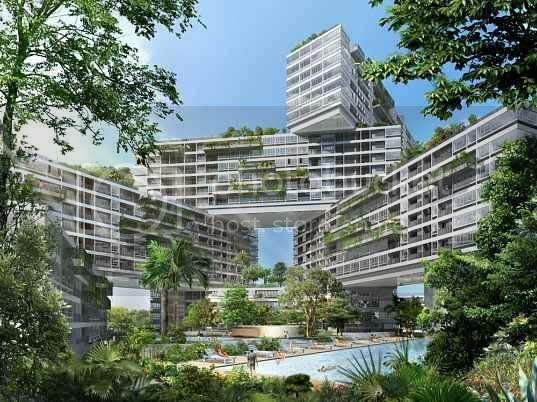 THE INTERLACE, scheduled for TOP by March 2015, is a 1,040-unit development built on 870,000 sq ft of elevated land. It comprises 31 apartment blocks, stacked in a hexagonal arrangement to form eight large-scale courtyards. The interlocking blocks resemble a “vertical village” with cascading sky gardens and both private and public roof terraces. Each apartment block (or “Superlevel”) is 6-storey high, so the highest units are either on the 18th or 24th storey, depending on the stack. This unique design is the brainchild of Ole Scheeren from the Office of Metropolitan Architecture (OMA), who also designed the China Central Television Station (CCTV) headquarters in Beijing and the Prada Epicenters in NYC and L.A.
One cannot argue about the central location of THE INTERLACE. It is just a 5-minutes drive to Vivocity & Sentosa (think I.R. ), 10-minutes drive to the CBD and 15-minutes to Orchard Road. The development is accessible via the AYE and West Coast Highway, while the uncompleted Labrador Park MRT station is about a 10-minutes walk away. We were told that there will also be a feeder bus service to Vivocity, which provide an added dimension of convenience. In addition, there are also some retail shop units for sale within the development itself. A total of 1,132 underground carpark (inclusive of 10 handicap) lots are available, and owners of the Townhouse units will get 2 carpark lots each. THE INTERLACE was soft launched in Sep 2009, with 233 out of the 360 units sold within the first week. The project was then opened for public booking in Oct 2009, and the sales gallery was subsequently moved from the previous location at River Valley to the current site last weekend. We understand from the marketing agent that less than 70% of the units were sold so far, which implies that sales have been sluggish after the soft launch euphoria. 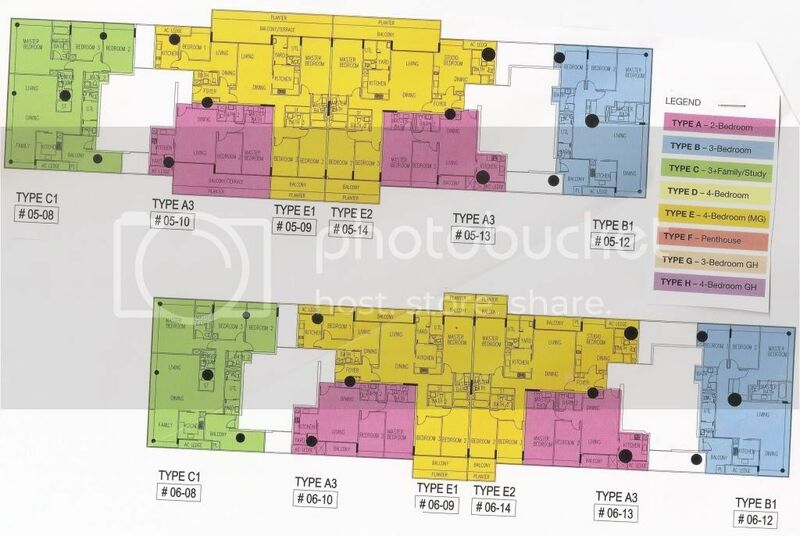 True to our previous post on this project, there is no showflat available for viewing – what you get is a large model of the development showing the block layouts and the facilities available, as well as model of the 3, 4 and 4-MG (Multi Generation, which is basically a 3-bedroom + studio unit) apartments. You also get to see the type of building materials that will be used for the apartment flooring, walls and wardrobes, but you have to imagine how all these will fit together for the final look. We were told that there will eventually be showflats available sometime during 2Q 2010. 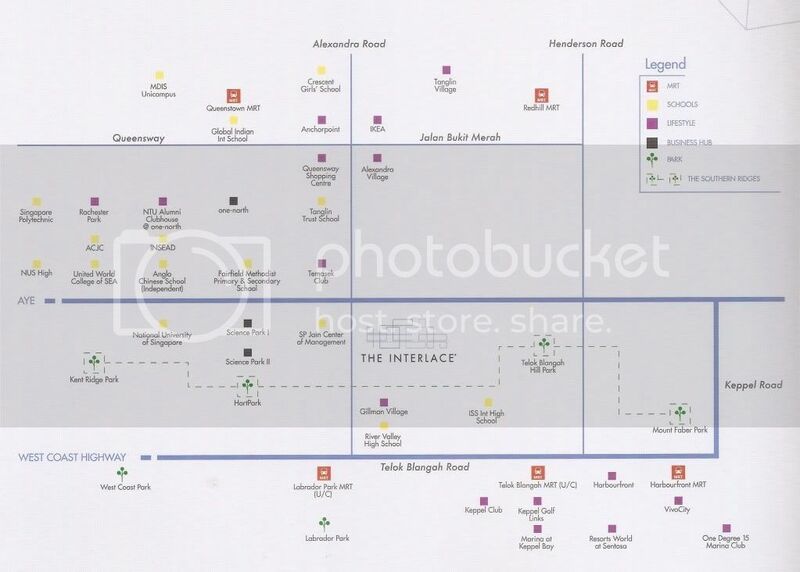 The developers felt that THE INTERLACE will sell by their names alone, given that both CapitaLand and HPL are “reputed” for quality high end projects like Four Seasons Park, Nassim Jade etc. As such, there is no real need for showflats. But being the conventionalist, we both feel that a showflat is still the best way for potential buyers to visualize how his apartment will/can look like. And going by how “fast” units are flying off the shelves, we may not be the only ones that feel that way. The units for the first phase are mainly in the blocks facing the AYE (Blocks 194, 196, 202, 204), and the penthouses (Block 220, 222). We were told that there is a 40m ingress between Blocks 194 and 196 from the AYE, and a 60m ingress for Blocks 202 and 204. So these should provide owners with some insulation from the traffic noise. The 18 penthouses launched are located on the fourth “Superlevel” (i.e. between the 19th and 24th floors), and are a mix of single level units and duplexes. This provides a whole new meaning to our understanding of “Penthouse”, which is a unit on the highest level of any apartment block. Then again, when you have developers hawking “baby penthouses” of less than 1,300 sq ft, anything is possible these days. • Theatre Plaza – where the clubhouse, gym, theaterette, billards/karaoke/function rooms are. • Water Park – where the 50m lap and different “themed” swimming pools are. • Play Hills – outdoor exercise and play area. • Spa Valley – spa & massage pools, Jacuzzi and steam rooms. • Theatre Plaza – outdoor extension to the clubhouse’s theaterette, for performance or outdoor movie screenings etc. • Bamboo Garden – supposedly where a bamboo forest and rock gardens reside. • Lotus Pond – supposedly 40m across.. more like a lake! • Waterfall Terrace – where the 3 tennis courts, multi-purpose court, another large swimming pool and party pavilions are found. The developer has created two viewing galleries on the 18th floor of an existing block to showcase the type of view you will get with some of the “good facing” units. We must say that the view offered by the South-facing units (assuming unblocked) is quite impressive – you get both the sea view beyond Labrador Park and greenery view around Hort Park/Southern Ridges. However, you have to be on the 13th floor or above to enjoy this view, else you be blocked by the tree lines. And before you go rushing down to the sales gallery with that cheque book, the units with this facing are not launched for sale yet! The North-facing units will get the City/Flyer view, which will come in handy for watching the fireworks display during National Day etc. However, you will also be facing the AYE and some of the industrial building/factory rooftops along Lower Delta, which may not be all that appealing. 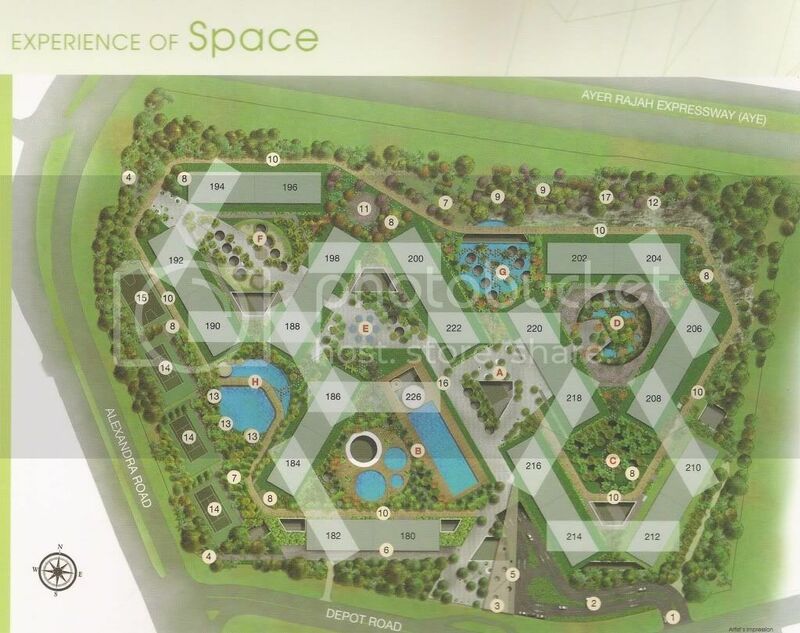 • The location – proximity to CBD, Orchard, One North, Fusion & Biopolis. Investors can expect good rental potential. • The 4-MG unit layout looks interesting – this is one of the few projects that offer such a layout. The fully contained studio unit within the apartment, with its own kitchen and living/dining area, is ideal for people living with extended family (in-laws, grandparents) or have frequent visitors that stay over. • The living room has homogenous tiles flooring – this is somewhat disappointing for a project from two “high end quality” developers. • We may be wrong, but we suspect some of the lower floor, inward facing units will suffer from insufficient natural lighting. So be prepared to switch on the lights even during daytime. • The layout of the blocks and units, while unique, do come across as “confusing”, so good luck to first time visitors trying to locate your unit. You may also have problem finding your apartment after a few drinks. • The wife has noticed that the bathrooms/toilets of most units are located in the centre of the apartment (extremely bad Feng Shui!) and without natural ventilations (windows). Experience has taught us that the artificial ventilators cannot expel odors as efficiently in a fully wall-enclosed toilet, so you are likely to get some “interesting smell” coming out from that toilet after awhile. • We cannot locate any primary school within 1-km of THE INTERLACE. • And finally, the price. 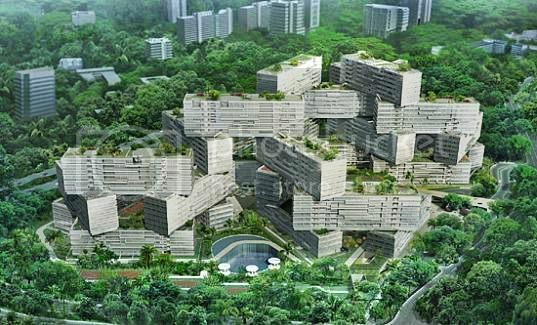 THE INTERLACE is currently selling at between $850 to $1,150 psf. So you can expect to pay an average price of about $1,000 psf for a typical unit. We feel that this is somewhat at the higher end for current 99-years projects. This is especially when you have to put your money down mostly by faith, given the atypical design (which can either turned out to be superb or an absolute disaster) and lack of visual representation on what you will actually get. In summary, we feel that the judgment is still out on THE INTERLACE. We will probably be able to form a better opinion about this project once the showflats are up and the prices for the “better facing” units are available. Thus, expect another update on this development in a couple of months’ time. And if you are still keen to visit the sales gallery meantime, do remember to bring along an umbrella in case it rains – the sales gallery (at the former clubhouse of Gillman Heights) is situated quite a distance from the carpark area, with no sheltered walkway in between. No Comment to " THE INTERLACE (1st Preview) "